Do you recognize when your inner victim sneaks up on you? Do you play victim to get sympathy or pity? Or, is your inner victim empowered? ​Does it protect your rather than letting people take advantage of you? ​The Victim Archetype is present in everyone. Its main objective is to develop self-esteem and personal power. This archetype, like the other Survival Archetypes, can be worked in either the light, empowering side...or the shadow, disempowering side. In the shadow, the inner Victim makes you feel sorry for yourself, and think that life is too hard. In this state you feel vulnerable, weak, defeated. You feel like you can't stand up for yourself and/or create healthy boundaries. You know nothing is going to work, and why you will fail. In literature, an archetype is a typical character, an action, or a situation that seems to represent universal patterns of human nature. From Swiss psychologist, Dr. Carl Jung, an archetype is a collectively-inherited unconscious idea, pattern of thought, image, etc., that is universally present, in individual psyches. When your inner Victim is in the light, it is willing to finally say “enough” to adversity, and strive for something better. The Victim is the fundamental champion of light over darkness in us all. 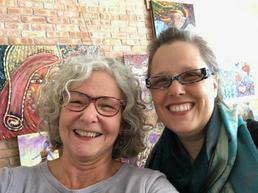 In this workshop, Cathy Parling and I, will lead you through inquiries, journaling and healing exercises, visioning and painting. You will have a better understanding of how this archetype works inside of you and how to work with it as an ally to lead a healthy life. The simple act of bringing an abstract concept like the Victim into physical reality (on a canvas) will make you relate to it in a more empowered way. It will make it real, not just a figment of your imagination. Also, one of the tools you will use is called Intentional Creativity®, this deep process will activate both sides of your brain which will give you access to new insights and new thoughts. ​Are you ready and open to this journey? - Acknowledge the ways you've been operating from the shadow side of the Victim Archetype and how it has impacted your life. - Validate your experience however it looks, or has looked like. - Release the judgments, shame, guilt, or anger that may come up as you become aware of your inner Victim. - Learn the most important thing that you could do to empower your inner Victim. - Be guided step-by-step to paint your Victim and use your canvas as a foundation for her to exist and become an ally. - Gather in Red Thread Circle with like-minded people and share sacred space. - Learn to develop a healthy relationship with the inner Victim. - Receive practical tools to use at home to stay empowered. No painting experience needed, the steps are clear and simple. This workshop is not a technical painting class. It is a spiritual and intuitive practice. You have all the answers inside of you; this process gives you a key to them. Evelyne Verret aka Coach Evelyne lives in Traverse City, Michigan and is originally from Québec City in Canada (yes, the Frenchest part of Canada! Don’t be surprised by her charming accent). She moved to Traverse City in 2011 after a five year journey in Phoenix, Arizona where she rediscovered who she really is as a woman, wife, mother, spiritual, and creative being. She is a certified Intentional Creativity and Law of Attraction Coach. She also completed the 2016 training intensive Singing Over the Bones with Senior Jungian Analyst and bestselling author, Dr. Clarissa Pinkola Estes (Women Who Run with the Wolves). I'm dedicated to helping people heal, shift, and grow into the person they want to be...the person they came here to be, their Authentic Self. I believe we all share one purpose in common and that is to come to Self-Love. It is through the journey to Self-Love that we discover the life we long to live and allow our light to shine brightly into the world. I have over 25 years experience working with people and assisting they're healing process. As well as being a Certified Toxic Emotion Practitioner, I am also a Reiki and SSR Master, and am certified/trained in Hypnotherapy, Transformational Breath, Esoteric Healing, and several other modalities. I regularly teach, coach, and mentor on a wide variety of subjects related to the mind/body/spirit connection. I love what I do! Ever since I was in my 20's I have believed that we have tremendous self-healing power. Over the course of my own life I have had experiences in healing the physical conditions of asthma, colitis, headaches, brain injury, depression and PTSD. In 2003 I co-authored and published my first book,”The Key to Me”. “A must read,” says Mark Victor Hansen of the Chicken Soup for the Soul series. The popular audio downloads I created to assist in Energy Management are called "Grounding and Your Column of Light" and the "Energetic Tune-up". I continue to write articles, blogs, a biweekly newsletter, and maintain my website Everhealing.com, as well as work with clients in-person, via Skype, and remotely.